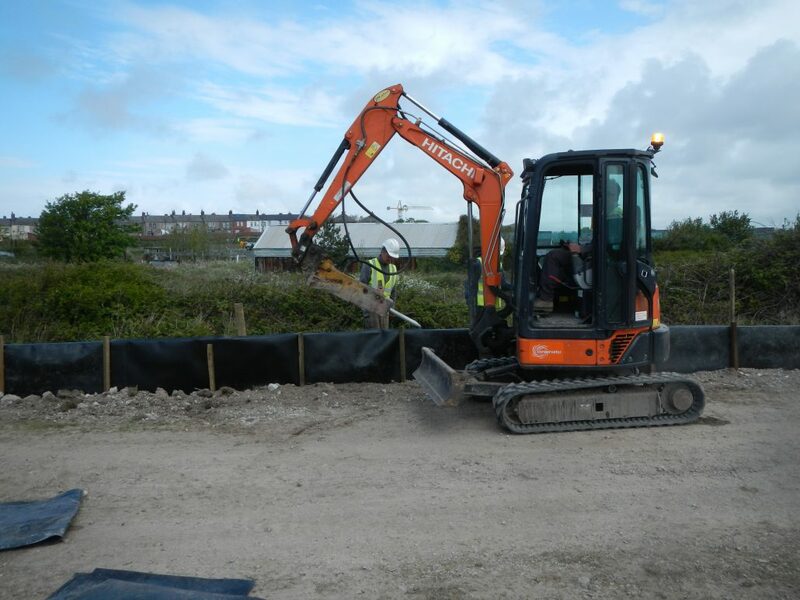 Conservefor, leading habitat mitigation contractor, were appointed by Capita Infrastructure to work alongside their team of Ecologist to undertake the habitat mitigation work which after the installation of reptile fences and vegetation clearance would enable trapping and translocation of the reptiles. Barrow waterfront is a brown field site which is owned and managed by Cumbria County Council and has been identified for regeneration. Prior to the development of the site ecological surveys identified Common Newts (Zootoca (Lacerta) vivipara) and Slow Worms (Anguis fragilis) were present across the entire area. Slow Worms, Adder, Grass Snakes and Common Lizards are protected against intentional killing or injuring and trade under the Wildlife and Countryside Act 1981 (as amended) The Nature Conservation (Scotland) Act 2004 and the Conservation of Habitats and Species Regulations 2010. Destruction of known habitats whilst reptiles are present may therefore lead to an offence. Supply and install a new two (2) metre high palisade fence (234 metres). 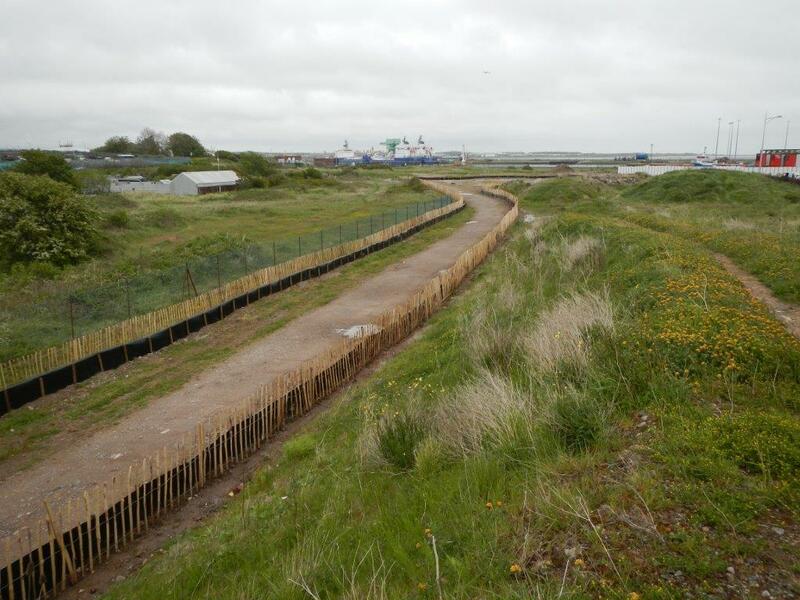 Vegetation Management – Under the supervision of an Ecologist strim the entire perimeter and identified internal areas creating a clear four metre wide corridor. 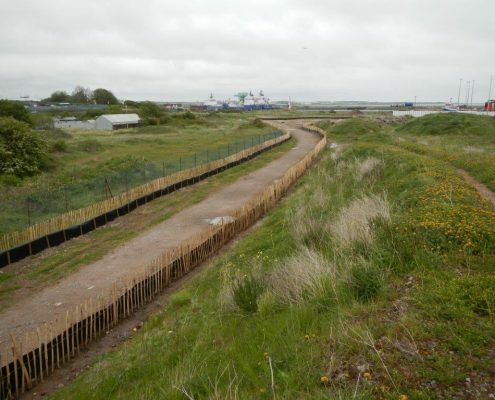 The whole of the construction zone was fenced in order to ensure that there was an impassable barrier between the development and the wider landscape for reptiles. 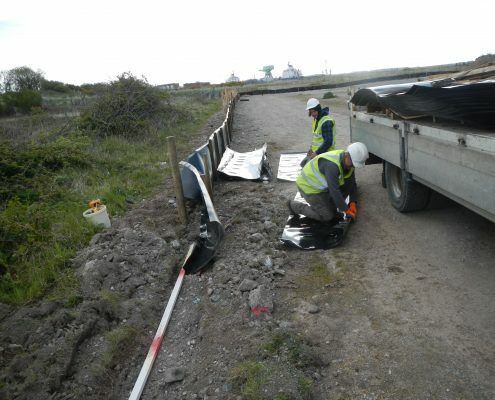 A semi-permanent polypropylene material that is tough and stabilised against ultraviolet light was installed to a depth of 20cm below ground and supported by stakes placed every one metre fixed with screws and washers. The fencing was backfilled with earth and tightly compacted to make sure that it acts as an impassable barrier. 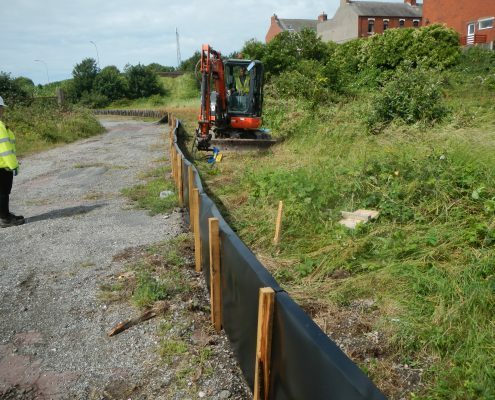 The advantage of the semi-permanent fence is that it is less susceptible to damage by dogs, deer, foxes and other animals as well as any accidental damage by residence and construction staff and is suitable for developments where fencing may need to remain in-situ over a long period of time. 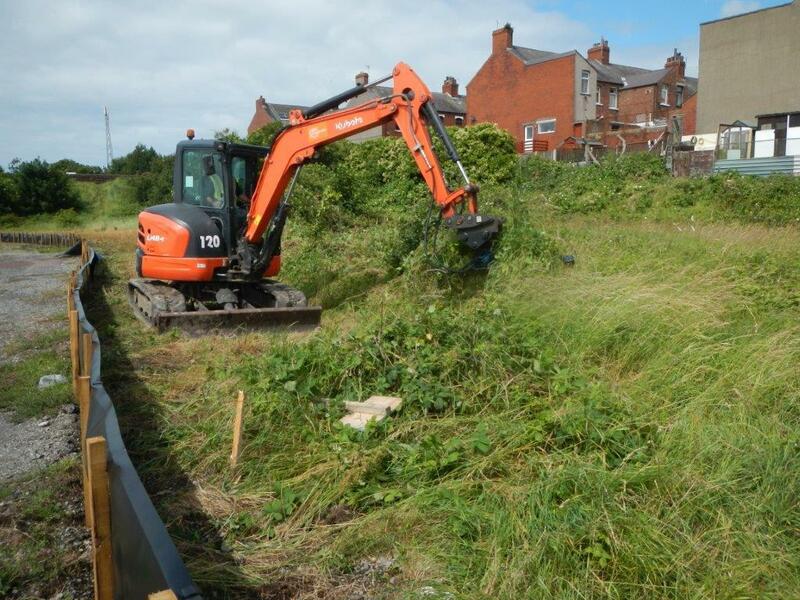 Under the guidance of Capita Ecologist NPTC qualified Conservefor staff completed the first cut leaving approximately 125mm of vegetation remaining. Following the second check for reptiles the vegetation was taken down to ground level. Strimming equipment and chainsaw’s where used for grass cutting and tree/shrub removal. 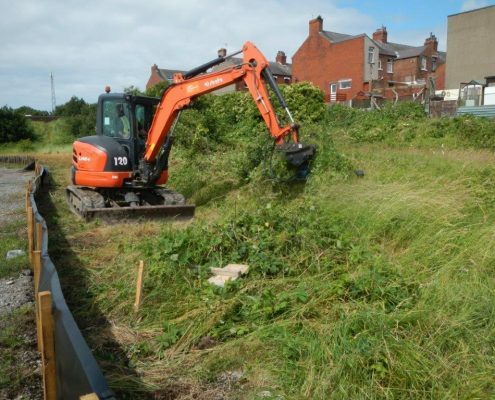 For the areas of dense brash and brambles we deployed a five (5) tonne 360 tracked excavator fitted with an HC 180 Autotorque cutter. 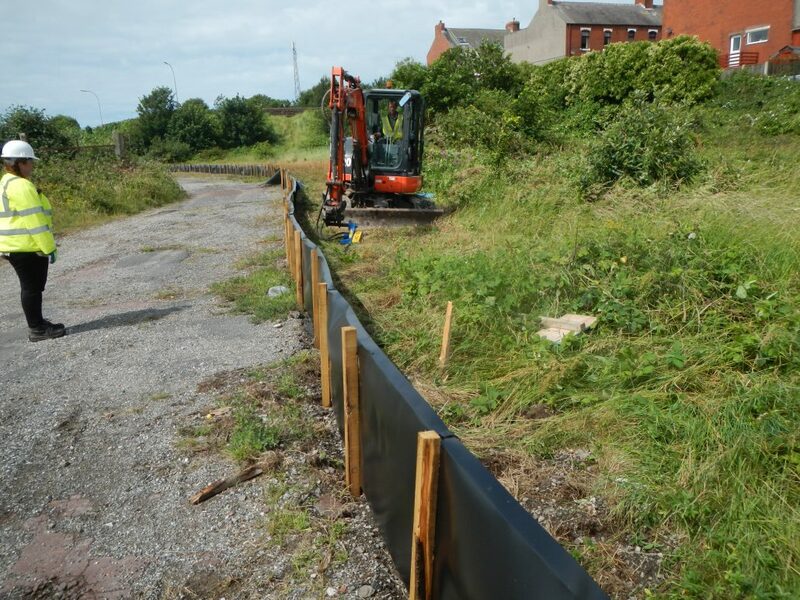 On completion of the installation work Conservefor, habitat mitigation contractor are maintaining the reptile fencing and vegetation.